Image by Lee Robbins Photographic - David Fielden Wedding Dress & Jimmy Choo Shoes for an urban, industrial wedding at MC Motors London City with pastel bridesmaid gowns & Groom in a Vivienne Westwood Suit. Liz The Bride: I’d known we wanted to hold our wedding reception at MC Motors in London’s Dalston for about a year before Fraser proposed to me! At that time I was working in PR at Alexander McQueen, so I was familiar with it as a photo studio and event space. We’d moved to our own place in the neighbourhood a year before he popped the question, so it was just a ten minute walk, and felt very personal to both of us. It’s a stunning warehouse space, originally a car mechanics, with cobbled floors, distressed walls in pale blue and cream and a spectacular glass roof that creates magical natural light – so important in my opinion. The best part is the surprising location – guests enter through a small door on Kingsland Road, a rather unappealing stretch of high street in a cool area of London, with no idea what wonders await them. The reception venue was the first thing we confirmed, and everything else was built around it. We turned the whole thing around in just under seven months, which was tight but absolutely doable, as we wanted to hold it on the May bank holiday weekend, allowing us to have a lazy pub lunch on the Sunday and get drunk again! It was important to us to hold our wedding in our area of East London, where we have lived for many years and where most of our friends are. The whole concept was based around the city we love and live in, and where I was born. We’d visited other venues outside London, but it just didn’t feel right for us. Once we had confirmed MC Motors, we knew we wanted to hold the ceremony at Stoke Newington Town Hall, a beautiful art deco town hall that holds civil ceremonies, in a leafy and pretty part of London. Neither of us are religious, so we knew a registry office was our best option, but I really wanted to make sure I had the walking-down-the-aisle moment with my Dad – many of the registry offices in London don’t have an aisle set-up, you just walk into the middle of a circle of chairs, but I really wanted to keep that tradition. Plus there is a cute little pub across the road where guests met for a drink before the ceremony, spilling out onto the street in the sunshine. The ceremony was beautiful, a real highlight of the day for both of us – laughter (I made a mistake when saying my vows!) and tears. I walked down the aisle to ‘Higher Love’ by James Vincent McMorrow, and the recessional was ‘You’ve Got the Love’ by Candi Statton. Walking back down the aisle as husband and wife feels amazing! 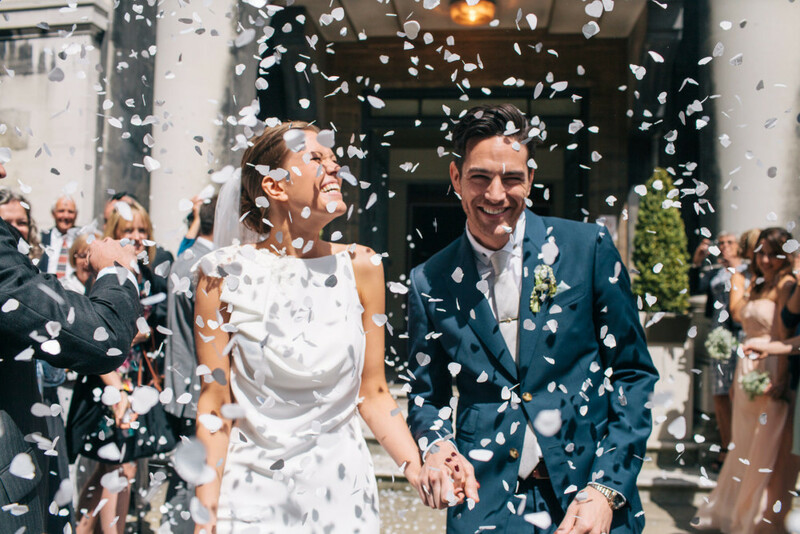 It had rained all morning, but as we came out of the town hall for the confetti, the sun came out – it really was a perfect moment that I’ll never forget. We left the town hall in our wedding car, a classic white London taxi cab, and our guests jumped into two vintage London buses. I have a fear of all those wedding styling clichés, so it was very important to me that our reception décor was classic, elegant and understated, avoiding anything that felt too overused or twee. A colour scheme never really appealed to me, I just knew I wanted muted tones. MC Motors has a lot of amazing vintage props to choose from, so we carefully selected the ones we wanted, keeping the battered leather sofas, the small café tables and chairs, the big stars, and of course their iconic ‘BAR’ light which we positioned at one end of the room. Our table plan was a large café board normally used for menus, and Fraser and I spent an entire day spraying the letters gold and then sticking each one on individually. I was lucky enough to have the help of two friends, Kat an event producer and Andy a set designer, who were invaluable in helping me with the set up of the room and the decor. 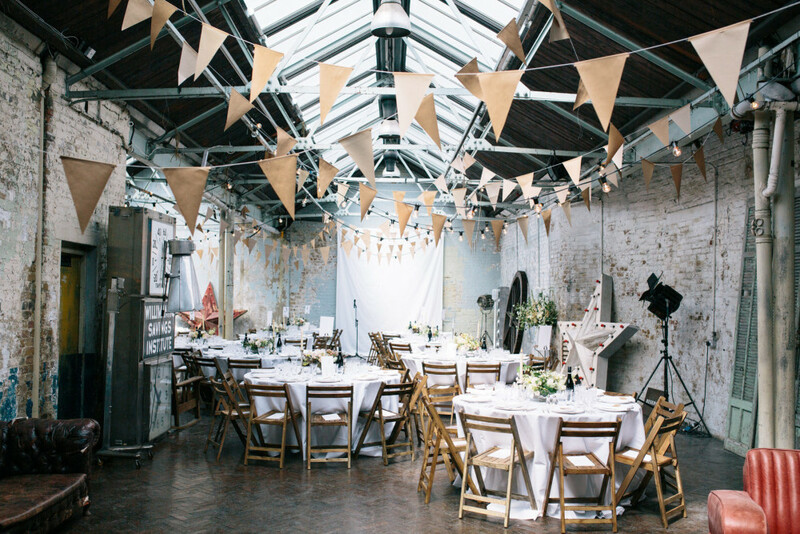 Alongside the furniture and props, we also hung festoon lighting and subtle brown paper bunting from the ceiling. We kept the same understated but chic approach for the table settings. Crockery was classic white, with crisp white table cloths and napkins, and silver salt and pepper pots and candle sticks. We accented with brown paper place cards, with names beautifully hand-written by the calligraphers Paul Antonio Scribe, and chose interesting patterned glasses. The flowers were hugely important to us, and I wanted them to be a real talking point. Kat introduced me to Flora Starkey and I fell in love immediately – her work is stunning and in my opinion she is the best florist currently working in London. I knew I wanted pastel shades and foliage, with a decadent and dramatic feel avoiding anything too traditional, and Flora delivered big time. The cake was pistachio and rosewater with butter cream icing made by my friend Alix Graham of Black Cherry Bakery, which Flora decorated with flowers that complimented the arrangement behind it – the whole thing looked amazing in photos. The pale blue of the walls really brought out the pastel colours of the flowers and the cake. Our bouquets were simple – lily of the valley for me, and gypsophila for my bridesmaids. My Dad is a graphic designer so he created all our stationery. I wanted something very simple and classic, but elevated into something beautiful via letterpress printing and gorgeous textured paper. One of our favourite personal details was the ‘Who’s Who’ guide we left on the seat of every guest as a wedding favour. We had spent months before the wedding writing short funny biographies of all the guests at the meal as a surprise, which Dad designed into a little book for us – we had been in hysterics writing them, and it went down a storm. When guests arrived at the space, we served champagne in coupes and a punch cocktail designed by our amazing bar team, Sweet & Chilli. We booked Goldilox catering for the food, known for family-style convivial sharing plates and a relaxed approach, which suited us down to the ground. Inside of traditional canapés, we had three canapé ‘stations’, including a whole leg of Serrano ham with olives and almonds, gazpacho with chorizo and croutons served in tea cups, and manchego cheese with quince jelly – absolutely delicious (not that we had time to eat any of it!). We hired a string quartet that we’d heard playing at the restaurant Hoi Polloi in Shoreditch, who played versions of our favourite 80s and 90s pop songs. The food we served for the meal included a whole side of gravadlax salmon that guests carved themselves at the table, and a delicious Italian slow-cooked lamb stew. In my experience, guests are always keen to get up and move around after the main course and speeches, so we served our cake on a side table for those who wanted dessert. Post-meal, the bar had two cocktail options we had designed in collaboration with Sweet & Chilli, plus a lot of Patron tequila – an absolute party essential. Above all else, our priority was to have a wild and fun party, and for all our guests to have the time of their lives – we both love a drink and a dance! A big consideration was the set up of the space as we wanted to ensure we were creating the best possible atmosphere. MC Motors is split into two rooms, so we set up the tables for the meal in the largest space, with two lounge areas for guests to relax in, and the drinks reception and the dancing were both hosted in the second room. The floor in there is cobbled and the owners of the space were worried guests might trip over, but I’m glad we stuck to our guns – I think it’s so important at a wedding to have the bar, dance floor and smoking area as close together as possible. Music was also a big consideration for us, and we knew pretty much straight away we wanted to book The Wedding Smashers. They really seem to be carving a niche for themselves in London, and play only the best wedding music, guaranteed to keep the dance floor packed all night but never veering too far into either cheesy or too-cool-for-school territory. We would recommend them without hesitation. At 11pm we headed off to the King’s Head members bar, a converted pub, to continue the party. We’d booked the drawing room, but everyone ended up dancing in the nightclub until dawn! 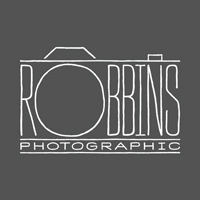 Photographer Lee Robbins was recommended to me by another photographer, and we chose him because his pictures were beautiful and editorial in style, avoiding those uncomfortable posed wedding shots with props and instead capturing the natural moments as they happen – although we did force him to do a few family shots (at my Mum’s request…). The finished shots are amazing and I still look at them all the time! I absolutely loved planning my wedding and wish I could do it all over again. I loved it so much that I have started my own event production and wedding planning business, Liz Linkleter Events, which is now my full time job. 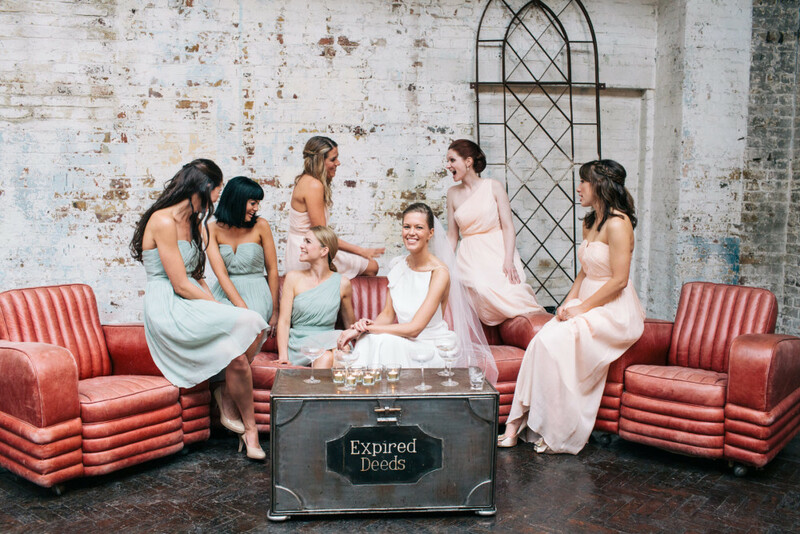 Following eight years working in the fashion industry, creating events of all shapes and sizes, I couldn’t wait to use all my experience to help other brides create their dream day. Oh man! This wedding is sublime. The fashion is spot on, the florals exquisite and the decor inspirational. Fraser is pretty darn hot too! wow! what a stunning venue! THAT DRESS!! I mean, the whole thing, but my god that dress!! Nice! Very stylish wedding, loving the shoe shot! WOW!!!! this wedding is all that I dream of for my own! I love the cool, industrial vibe, totally up my street. Sometimes you can get carried away with pinterest and shabby chic fashion but this has refocused me. I wish it said about her opinions on her dress, groomsmen and bridesmaids etc. This looks a very ‘high end’ wedding but I will pin some of her lovely ideas and try to recreate some as my own. Thanks!! It’s a truly beautiful concept isn’t it Catrin, we’re big fans too. Gorgeous photos and a brilliant concept, your dress is stunning! I love the muted tones and battered sofa, they’re perfect in your photos. Im in the process of planning my reception and like you I want muted tones with the exception of our chairs, a gold chaise lounge from http://www.decur.co.uk has caught my eye and I can already picture it in my photos. 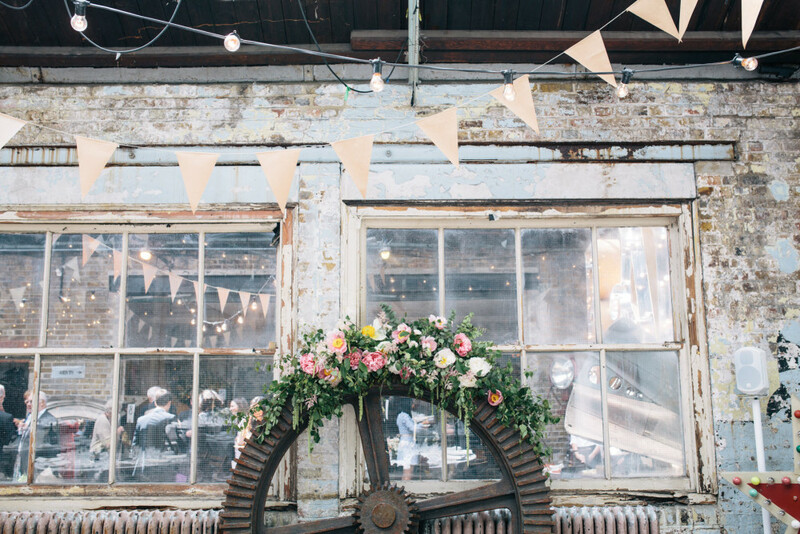 I just adore the industrial style, congratulations on your wedding. 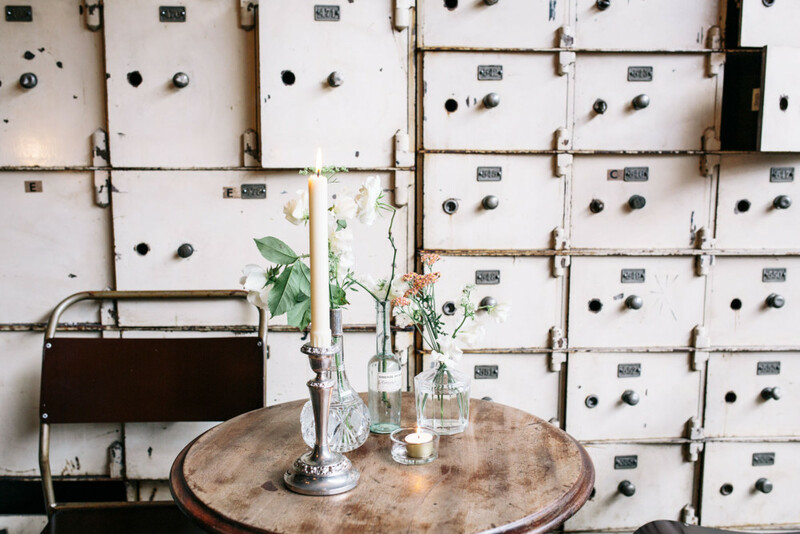 Such a lovely wedding – the styling is amazing! Would love to know where your brown paper bunting came from, have been searching everywhere for some like that! The dress had a built-in bra. Cunning! Two set-design friends of ours made the brown paper bunting for us. It’s actually very simple, you cut out brown triangles of paper and fix onto string/rope, but it’s very time consuming. Our incredible florist Flora Starkey provided all the flowers vessels. Absolutely stunning venue and lovely photos. Great looking couple too.